Here it is. The best appetizer I’ve ever had at a restaurant is the Outback Steakhouse Bloomin Onion Appetizer. It’s better than any onion ring I’ve ever had and includes the best dipping sauce in the world. I mean, this stuff tastes GOOD! Why spend 7 bucks PLUS whatever you’d spend on entrees for your family, when you can make this tasty appetizer dish at home? You won’t believe how easy it is to make. And of course–how easy they are to eat! Seriously, these flaky bits of onion are so absolutely tasty–they are not to be missed. 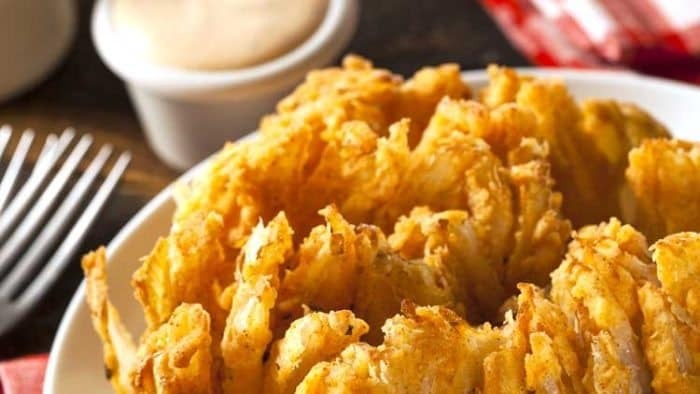 Just a couple things are needed to make the best Bloomin’ Onion Appetizer ever. I can’t tell you how much I love eating this up! Like I’ve said how much I love this appetizer. But, we can’t forget about coming up with something equally amazing to serve as an entree. We like our favorite Ribs Recipe, Grilled Chicken Halves, or Bacon Wrapped Stuffed Chicken Breasts, to serve with a Bloomin’ Onion. Well, we can’t forget about that, can we? An Apple Pie or Blueberry Tart . Because–dessert. And what a way to finish a meal, right? If you don’t have a flower onion cuter or deep fryer already, you can order them on Amazon and get free shipping with Amazon Prime free 30 day trial. I’ve gotten so much use out of my Amazon Prime membership–free shipping, television shows, and movies. I love it! 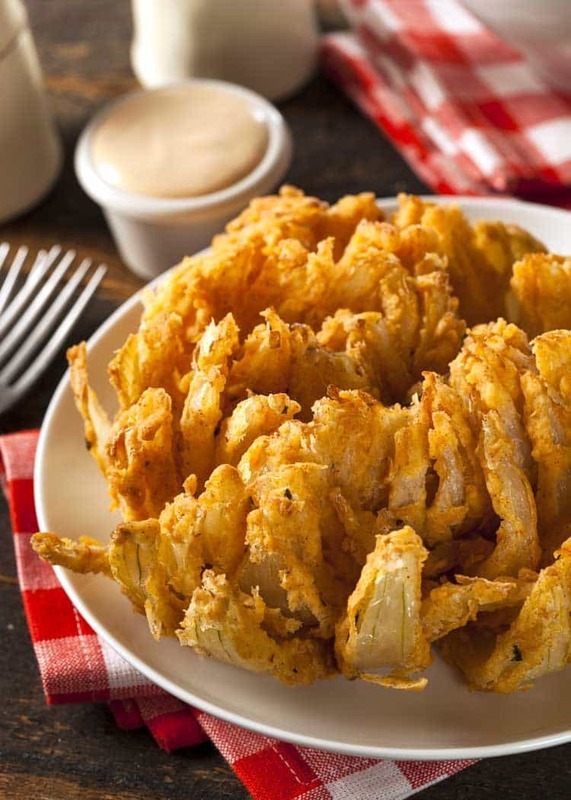 We love this Bloomin Onion Appetizer recipe served up with grilled ribs or chicken. You won't believe how easy this is to make! To slice the onion, cut off 1/2 inch from the pointy stem end of the onion, then peel. Placing the onion cut-side down, start 1/2 inch from the root, and make a downward cut all the way through to the cutting board. Using another bowl, mix the flour, cayenne, paprika, thyme, oregano, cumin and 1/2 teaspoon black pepper, using a whisk.